Traveling is easy everywhere as long as time and money is not a problem. If you have the money than you can travel anyway you want; and if you have the time as well then you can travel for as long as you want. But that is not really the case with everyone always. Sometimes there are places that you so badly want to visit but cannot because your pocket or schedule won’t allow it. What do you do then? Well time is really unique to every individual and a personal matter so that you will have to handle on your own. In terms of money however, there are a few things that you can do to reduce the cost. The place that I am referring to here is Kinnaur in Himachal and in this article; I will talk about how you can make a budget trip to Kinnaur Valley. For a better and easier understanding, I will begin with laying down an example of an itinerary. A travel plan that will cover almost all of Kinnaur while ensuring that you do not travel too much on any given day. I will then explain the cost breakdown of all these days and how you can keep it at minimum. Your final travel plan will of course depend on how many days you have in hand; but the information below should at least give you an idea in terms of expected expenditure. For the sake of this article, I will assume that you are starting your journey from Delhi. If you were however coming from a different place, then only the details for first and last day will be different. Rest of the information for remaining days will still apply. So how do you travel to Kinnaur within a budget and keep the overall cost at a bare minimum? Well the first thing you got to do is to leave your own vehicle at home and ditch the idea of a private taxi. For this journey, you are going to completely rely on the local bus service and shared taxis. Fuel cost will become your biggest expense for this trip. The only time I will recommend you to bringing your own vehicle is when you have a group of friends to share the cost with. If you are traveling solo then public transport is the way to go. Fortunately enough, Kinnaur still carries its tag of “offbeat” and “lesser visited” destination due to which not many people travel in its direction. Thousands of tourists come to Shimla and Narkanda each year but only a few would venture ahead towards Kinnaur; and the ones who do are mostly traveling towards Spiti Valley. Call it good or bad but due to this, Kinnaur is still saved from the tourist mania and things here are simple still. Throughout the valley, finding an accommodation within budget is not going to be a big deal. You will easily be able to find a place to stay here for as low as Rs. 500 to Rs. 700 per day. If you were traveling with a friend who would share the cost with you then this price comes down to Rs. 250 to Rs. 350 per person. In terms of food, you can easily find small Dhabas here where you will not have to pay Rs. 50 or Rs. 60 for a plate of “Daal” or “Sabzi”; and a “Roti” will cost between Rs. 5 to 10. Eating at these Dhabas, you can easily cap you per meal under Rs. 100. For the entire day, two meals. light breakfast, a few cups of tea and you will be done under Rs. 300 to Rs. 400. Also Read: How to Calculate Cost or Budget of Kinnaur Valley Trip? Now let me explain a simple cost calculation with the help of an itinerary. 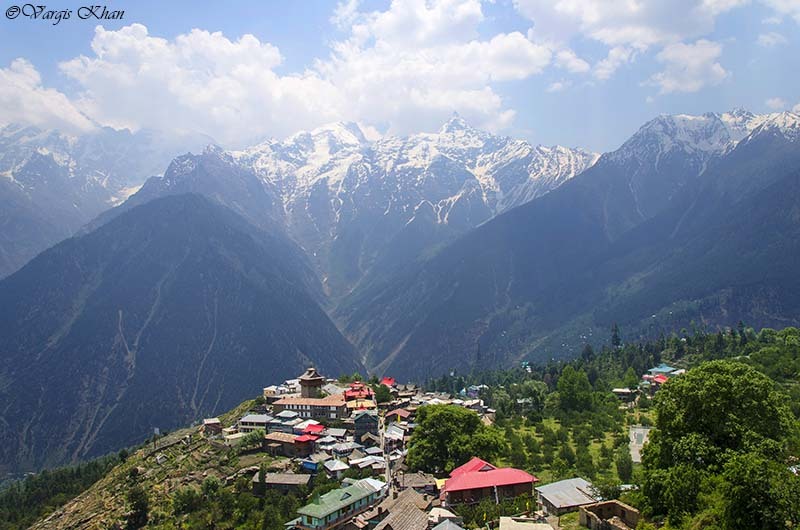 The reason why I am recommending this itinerary is because it ensures that you see all that there is to see in Kinnaur; without traveling too much on any given day. If you have more time than 7 days then you can stay for a few more days at either of the places mentioned. A lot of people tend to skip Shimla and stay at Narkanda which I will recommend against doing. If you are traveling on budget then break the journey in Shimla only. Out here, you can easily find a hotel for Rs. 500 per day but at Narkanda, I don’t think you will find anything below Rs. 1500 these days. There are numerous buses from Delhi ISBT Kashmere Gate plying daily towards Shimla. You can board either of these buses as per your convenience. Fare per person is approximately Rs. 500. If you opted for an AC Bus then it would go up to Rs. 800 – Rs. 1000. There are endless hotels in Shimla city and you will easily find one for Rs. 500 to Rs. 700. Eating at small dhabas, your food cost will be about Rs. 300 per person. There is an early morning bus from Shimla to Sangla that you will have to board; so make sure you are at the Bus stand at around 6 AM. Traveling by this Bus, you will reach all the way till Sangla and from there, look for a shared cab for Chitkul. Bus to Sangla will cost you about Rs. 250 and then another Rs. 50 for Sangla to Chitkul. There is an HPPWD rest house at Chitkul where you can stay for Rs. 500. If not the rest house, then there are several other budget accommodation choices available. Negotiate a little and then will lend you a room for about Rs. 700. Food cost for this day too will remain Rs. 300. Now this is where it gets a bit tricky. There is really no budget accommodation available at Kalpa. Every hotel here will cost you about Rs. 2000 at least. If that works for a day then you can stay at Kalpa; otherwise look for accommodation in Reckong Peo itself. There are a few guest houses here where you may find a room for about Rs. 1000 to Rs. 1200. There are two buses from Chitkul for Reckong Peo; one in the morning and another one at noon. Fare per person is approximately Rs. 100; and then you will spend another Rs. 50 for a shared taxi for Kalpa from Reckong Peo. There is also an hourly bus available from Reckong Peo for Kalpa. I am assuming that you are squeezing your budget a bit on this day and staying at Kalpa for Rs. 2000 a room after negotiation. Food expense will remain at Rs. 300 to Rs. 400 per person. Your next destination is the village of Nako in the upper region of Kinnaur District. To get here, you will first have to get back to Reckong Peo from Kalpa. Make sure you do this before 7 AM because your Bus leaves Peo at 7.30 AM. This is a daily bus that runs from Reckong Peo to Kaza. You will board this bus and then get down at Nako. Fare per person will be Rs. 50 for Kalpa to Peo and then Rs. 250 for Peo to Nako. Hotel Charge at Nako will be about Rs. 700 to Rs. 1000. Assume Food Cost here at Rs. 500. You travel for this day may get a little hectic and you will have to shuffle between different modes of travel. There is a daily Bus that runs from Kaza to Reckong Peo which you will first board from Nako. Board this Bus but do not go all the way to Reckong Peo. Get down at the highway itself before the Bus turns right and climbs up to Peo town. From the highway, look for a Bus or shared taxi going towards Shimla, Rampur or Jeori. If you were able to find one going straight to Sarahan then nothing like it. If not, then board any other that can drop you off at Jeori. From Jeori chowk then, look for a shared cab going towards Sarahan. Total travel cost will be about Rs. 400 to Rs. 500. Hotel at Sarahan will cost another Rs. 500 and food cost will be Rs. 300 for the day. From Sarahan, get a shared cab back to Jeori and then board a Bus for Shimla. Total travel cost will be about Rs. 200. Hotel and Food at Shimla will be another Rs. 800 to Rs. 1000. Once again, board the local HRTC Bus from Shimla for Delhi; fare per person will be Rs. 500. Assume another Rs. 300 as food expense for the day. Now this total cost of Rs. 9400 to Rs. 10600 too is only if you went traveling alone. If you were traveling with a friend then the accommodation cost will get shared; and the overall expenditure will be even lesser. If you owned a motorcycle, are confident enough of your riding skills and have a friend as pillion then I will recommend that you make this a bike trip. In the itinerary above, you will be traveling about 1500 kilometers at most. Even if your motorcycle was giving a mileage of 25 kilometers per liter, you will still end up spending about Rs. 4,680 for fuel. Split this in two people and you get a per head cost of 2,300 which is about the same that you will spend by public transport. Benefit by your own motorcycle however would be that you won’t be depending on bus schedules; or waiting for shared cabs. You will be able to travel freely and enjoy the journey better. The only factor to consider is the cost incurred while getting the motorcycle ready and serviced for the trip; and any wear and tear expenses after. If that is not a problem then by all means, make it a bike trip. I hope the information above on making a budget trip to Kinnaur valley was of help. If you have any other questions; or need any further details; please feel free to ask in the comments section below; or at our Community Forum; and I will be glad to answer.